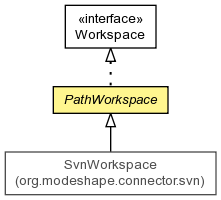 The Workspace implementation that represents all nodes as PathNode objects and stores them in an internal data structure that allows for nodes to be accessed via a Path. Subclasses are required to provide thread-safe access and modification of the state within the encapsulated data structure, since multiple Transaction implementations may be committing changes to the data structure at the same time. However, this class does not provide any thread-safety, since the nature of the thread-safety will almost certainly depend on the actual implementation. For example, a subclass may use a lock, or it may use a map implementation that provides the thread-safety. A specific operation that mutates the underlying persistent repository. Successively (and in order) apply the changes from the list of pending commands All validation for each of the objects (including validation of resource availability in the underlying persistent store) should be performed prior to invoking this method. Create a change command that represents the movement of a node. Get the node with the supplied path. Move the node from it's previous location to the new location, overwriting any previous node at that location. Save this node into the workspace, overwriting any previous record of the node. Remove this node and its descendants from the workspace. Verify that the supplied node exists. Save this node into the workspace, overwriting any previous record of the node. This method should be overridden by writable path workspace implementations that use the default PathWorkspace.ChangeCommand implementations. Move the node from it's previous location to the new location, overwriting any previous node at that location. This method should be overridden by writable path workspace implementations that use the default PathWorkspace.ChangeCommand implementations. The move operation is intended to reflect changes to the node's name or parent only. Changes to the children or properties of the node should be reflected separately in a put command of some sort. The details of the put command are implementation-specific. Remove this node and its descendants from the workspace. This method should be overridden by writable path workspace implementations that use the default PathWorkspace.ChangeCommand implementations. All validation for each of the objects (including validation of resource availability in the underlying persistent store) should be performed prior to invoking this method. Create a change command that represents the movement of a node. The movement record will only reflect the changes to the node's name and/or parent. Changes to the node's properties or children should be ignored. A separate put command should be used to reflect these changes.